In my younger years, I had a good friend that I wanted to come to faith in Christ. An event happened that I thought could only be solved by a miraculous move of God. If God acted, it would prove to my friend that God is real (and I was right). So I decided to pray through the night and see if I could twist God’s arm into moving. I prayed through the entire night and no miracle came. I went to bed thinking that I had done all I could do. What more could God possibly require than an all-night prayer session? Why wasn’t He moving? Later the next night I was again praying before God for Him to move. And in His infinite grace, He spoke. It was not an audible voice, but rather a firm and clear flow of thought that I knew was not from me. He said: “Just remember who you are. 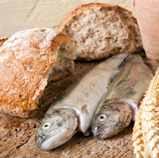 You are just a boy with a couple of fish and a few loaves of bread.” I was humbled and elated at the same time. All I could do was laugh at my naive pride. God was so gracious. He humbled me, put me in my place, erased that sense of pride, and gave me the promise that if I gave Him the little that I had, He would multiply it to an incredibly abundant feast. And so I did. In prayer I gave Him everything that He had given me and asked Him to bless it and use it to His glory. And He has been doing this ever since–taking my little offerings and multiplying them for His glory. So I’d like to encourage you: give God back the little that He has given you and see what He does with it. PS. After we had sorted out that part of my heart through repentance, faith, forgiveness and love, God spoke further, saying that He would solve the situation, but not in the way I wanted. There would be no clear miracle, and God would get no glory. And I was okay with that. He was doing what He wanted in His own way, and He was letting me tag along.